As part of ‘Workplace Week‘ I had the rare opportunity to visit Westminster Palace and see it through the eyes of a Facilities Manager, which was highly fascinating and intriguing. Andrew, Head of Facilities for the Parliamentary Estate guided us through Portcullis House, the building on the Embankment, where all MP’s have their offices, and finally through Westminster Palace and the House of Lords – a workplace, too, and quite a stunning one. Portcullis House, built in 2001 by Michael Hopkins and Partners, often publicly scolded for its ridiculously high constructions costs (£235m) is a building that looks quite boring from the outside. Walking along the Embankment, I have never really noticed it before, and I don’t know anyone, who thinks this is a beautiful building from the outside. However, having seen its interiors really changed my mind. While the upper floors look rather traditional with a rectangular system of corridors around the central atrium, wood-paneled walls and cellular rooms left and right and everywhere, the ground floor courtyard with its magnificent roof structure is simply stunning – it is bright, friendly, vibrant and very sociable. It was heavily used throughout the whole afternoon, when I was there and I can clearly see why. I’d love to work and have coffees here. 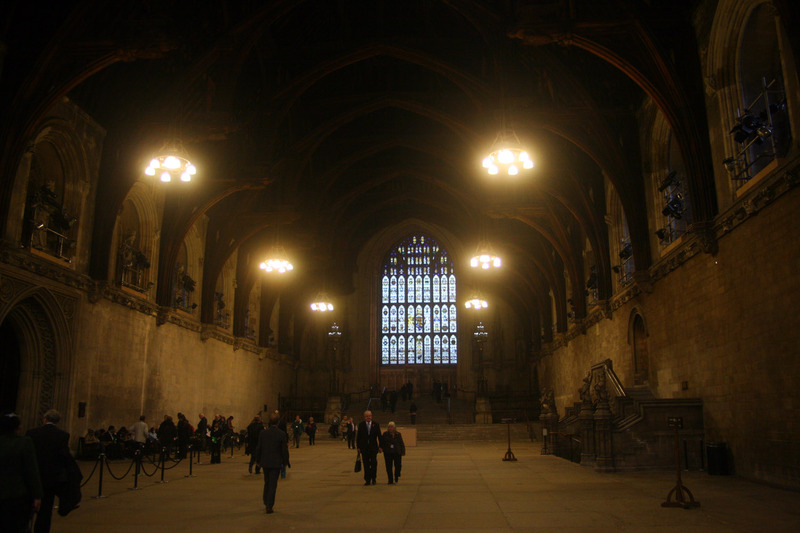 After seeing Portcullis House, we went underground to make our way into Westminster Palace. Of course it makes sense to provide a shortcut from Portcullis House to Westminster for all the MP’s and staff, so that they don’t have to use the public realm, but still I was amazed to be led through an underground corridor crossing underneath Bridge Street to connect the two sites. 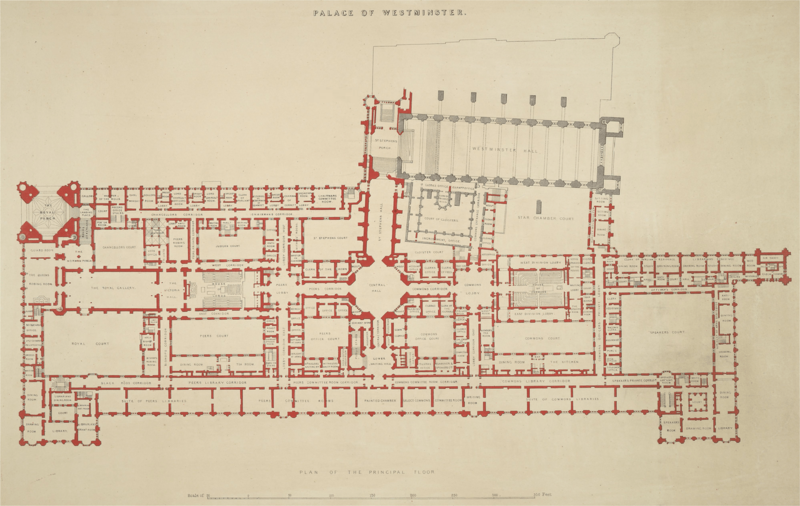 The corridor is not underground for long and soon opens up towards the courtyard of Westminster Palace. Our next stop on the tour is Westminster Hall and I wonder how this fits into the theme of the tour of ‘Westminster as a Workplace’. The hall, once a multi-functional space used for court proceedings, ceremonies, meetings and festivities and as such clearly a workplace is still used for state banquets of the Queen and other representative functions and events, but it also serves as a backdrop for the media, for instance when interviewing MP’s. We then make our way into the depths of Westminster Palace, where finally I am no longer allowed to take any pictures. Still, I am really enjoying the tour. 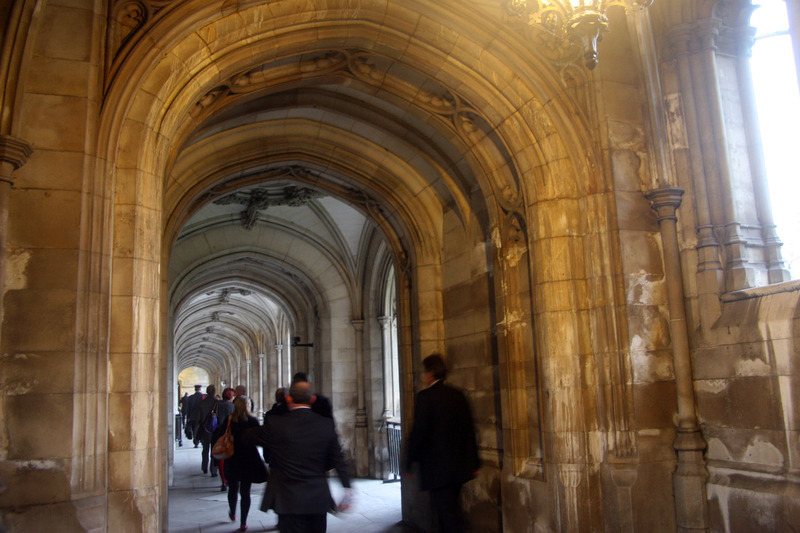 We enter St Stephens Hall, which serves as the main corridor into the Palace from Westminster Hall, leading to the House of Lords and the House of Commons. We pause for a short while in the Central Hall, a circular space, where the corridor to the House of Lords turns right and the corridor to the House of Commons turns left and which used to be and still is functioning as a lobby, i.e. a space for commoners to meet their representatives on their way to parliament to lobby for their causes (therefore the name ‘lobby’ for a lobby). We make our way into the House of Lords to listen to a debate for some 15 minutes (nothing incredibly interesting, I’m afraid…) and then marvel at the beauty and tranquility of The Royal Gallery, a place for members of the House of Lords to do some work with 16 ancient looking desks, arranged in groups of 4 with low reading lamps and dimmed light in what felt like a library atmosphere. 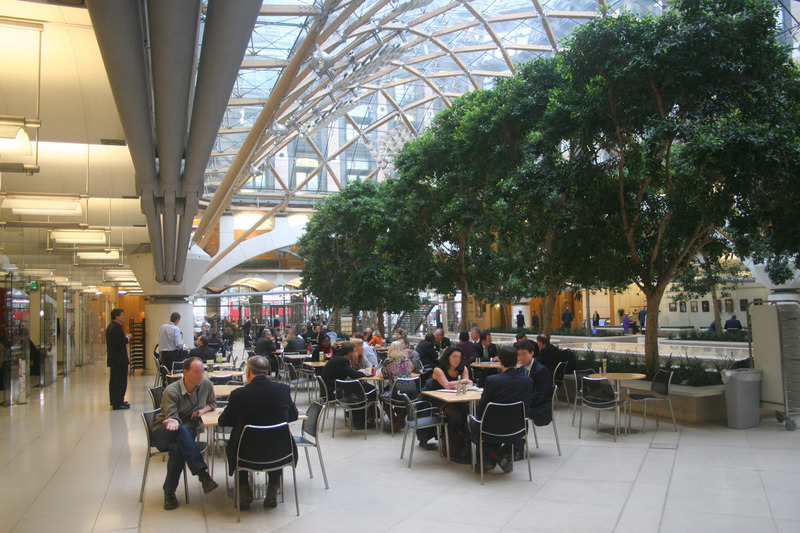 This clearly must be the World’s most generous open-plan office (including flexible working – no one should say that the Lords would be old-fashioned!). And finally we end the tour in the stunning robing room of the Queen, where she gets dressed and prepares herself for speeches, so this, too, is a workplace (even though not a heavily occupied one). The whole visit to Westminster Palace and Portcullis House was incredibly interesting, not only because it was the first time for me to visit the House of Lords and see Westminster Palace from the inside (shame on me after more than 5 years living in London, but I guess this turns me into a Londoner even more – sightseeing is for tourists! ), but also to see Westminster Palace from a refreshing new perspective: exactly not as a place for tourists, but as a place, where people work, a real workplace. ← What makes a school a school, a church a church and a shop a shop? Thoughts on building typology.